When: June 8, 2019 – 11:00 am to 3:00 pm. Please NO alcoholic beverages allowed!!! Bring your lawn chairs, cash, and be ready for a great time. 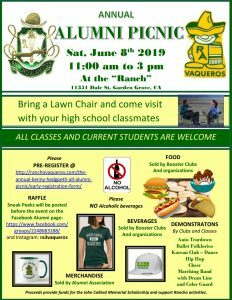 Come join the fun as we reconnect with our high school friends and families. All classes and current students are welcome to join the fun. Anyone interested in helping with planning the picnic, please join us!